What is a Good Income for an “Average” Entrepreneur? If you check out the self-help section of a bookstore, you’ll find a subsection on financial health: books that will speak to making your first million by age 35. You will find titles such as Rich Dad, Poor Dad, The Millionaire Fast Lane, The Millionaire Next Door, and more. All of them have formulas for getting rich. And most of them involve taking big risks as an entrepreneur, filled with stories of extreme success and failure. And most end up encouraging you to follow your dreams to extreme wealth. But wealth is very relative. Someone earning $30,000 a year in Eastern Europe is wealthy. Someone earning that same amount in the United States is in a low-income bracket. And having a million dollars in the U.S. these days is not all that uncommon. Many who reach retirement age, who have been employed for 25-30 years, have that amount in assets, investments, and retirement plans they began years ago. As an entrepreneur, you may have goals of becoming rich. And those are good goals that you should never abandon. Being realistic, however, you should know the data. 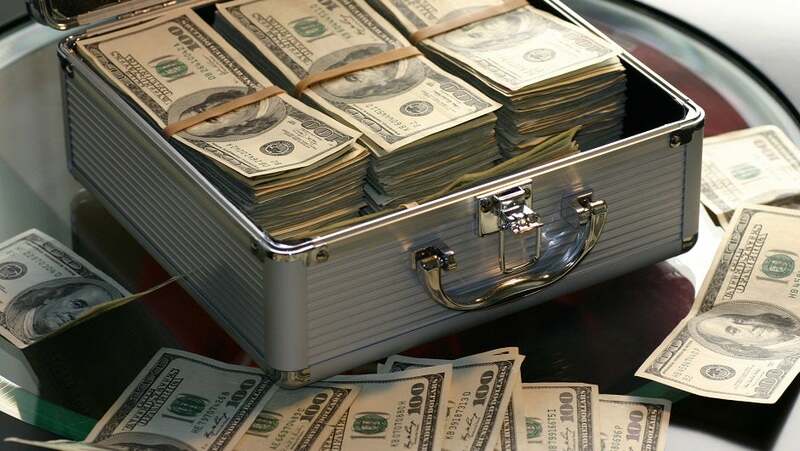 A study conducted by American Express OPEN and reported by Business News Daily, shows that the majority of entrepreneurs earn an average-to-above-average income. They are not Mark Zuckerberg’s. They are individuals who want a life as an entrepreneur, are willing to work hard to grow their businesses, and want a good income. Most often, the path to a decent income from entrepreneurship is a step-by-step process that results in average-to-above-average revenue. The figure, in U.S. dollars, is $64,000, on average. Given that the average household income in the U.S., according to the latest census, is $50,500, the average entrepreneur does better than average. That should give you some satisfaction, as you contemplate how well you are doing. Of course, you want to do better, but there are steps you can take right now to increase your net worth, and you should be considering these. You do not have savings and retirement plans that regular employees have with their organizations. But this does not mean that you should not pursue the same avenues that employed people pursue to increase their wealth. You are going to reach retirement age just as they will, and you will want a net worth that will provide well for your senior years. Consider Mark Zuckerberg’s story, a very young man, worth an estimated $57.3 billion. How much risk did he really take? Actually, not much. He began a social media site on his college campus, nurtured his idea with a few peers, and launched Facebook at just the right time. Other massively wealthy people took risks, of course, but only a very few actually hit financial rock bottom before they rose to their wealth. If, as an entrepreneur, you are taking risks, be reasonable about them. Employees may contribute up to $18,000 annually into a 401K plan through their work. What can you do? You can open an IRA now, commit to living below your income and start saving. 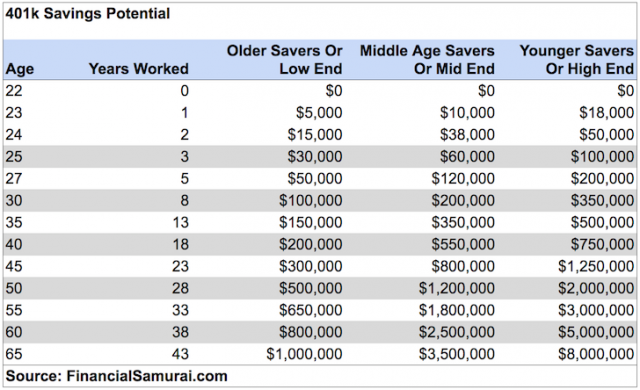 The following chart from FinancialSamurai.com shows what a regular savings plan can do for individuals based upon when they begin and for how many years they contribute to a retirement savings plan. It’s obvious that the earlier you begin to save, the greater your net worth upon retirement. Of note is that these are only potential worth figures, based upon an 18 percent contribution each year. You may not be able to do this, but, don’t put it off. There is a common thought among millennials that they want to be mobile, not tied down. And, many have student loan debt that prevents major purchases, such as a home. They like the flexibility of being mobile, and they change jobs far more often than their parents and grandparents did. As an entrepreneur, however, you are sticking with one thing – your business. Consider this: Over the long haul, if you rent rather than own, you will reach retirement still renting. If, on the other hand, you make the decision to purchase a home, even if you sell it and purchase another and another as you move through your earning years, at some point you will have a home that you have paid off. When that mortgage is paid off, you have additional monthly income (the mortgage payment) that you can save. At this point, you are putting what you can in pre-tax savings; you are living below your means so that you can save, and maybe you have made the move to buy rather than rent. Your business is on-track and growing – something that will allow you to improve your lifestyle and increase your savings. Still, within you is that feeling that you may be missing something – some new way to make money on a larger scale. This feeling is the result of your optimism about your capabilities. There is something “out there” that can bring in more money, maybe lots of it. Your entrepreneurial spirit will keep you looking for it – the next big idea or opportunity. You have a plan for your long-term financial future, so you can relax.